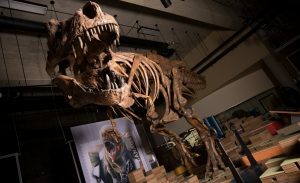 A new exhibit featuring the skeleton of Scotty is set to open at the Royal Saskatchewan Museum in May 2019. Photo via Amanda Kelley. Paleontologists have reported that a Tyrannosaurus rex unearthed in Canada – nicknamed “Scotty” – is the world’s largest so far, at 43 feet (13 meters) long. Scotty, nicknamed for a celebratory bottle of scotch the night it was discovered, has leg bones suggesting a living weight of more than 19,400 pounds (8,800 kg), making it bigger than any carnivorous dinosaur yet discovered. This is the rex of rexes. There is considerable size variability among Tyrannosaurus. Some individuals were lankier than others and some were more robust. Scotty exemplifies the robust. Take careful measurements of its legs, hips, and even shoulder, and Scotty comes out a bit heftier than other T. rex specimens. The skeleton was first discovered in 1991. But the hard sandstone that encased the bones took more than a decade to remove. Scientists have only recently been able to study the skeleton fully-assembled and realize how unique a dinosaur Scotty is.